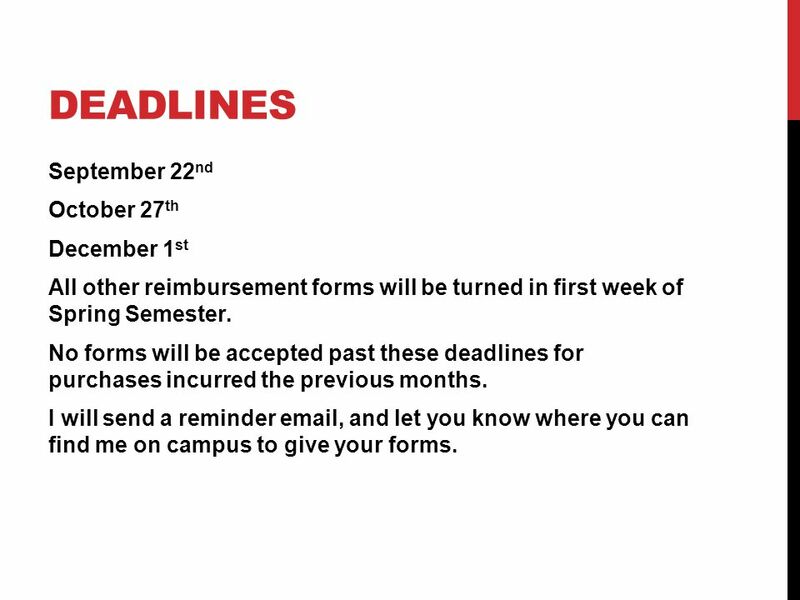 3 Deadlines September 22nd October 27th December 1st All other reimbursement forms will be turned in first week of Spring Semester. No forms will be accepted past these deadlines for purchases incurred the previous months. I will send a reminder , and let you know where you can find me on campus to give your forms. 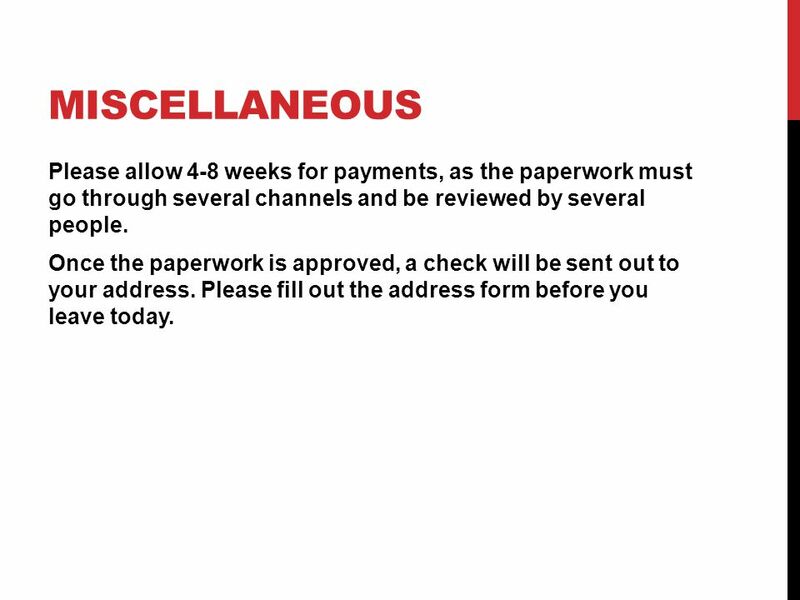 4 Miscellaneous Please allow 4-8 weeks for payments, as the paperwork must go through several channels and be reviewed by several people. Once the paperwork is approved, a check will be sent out to your address. Please fill out the address form before you leave today. 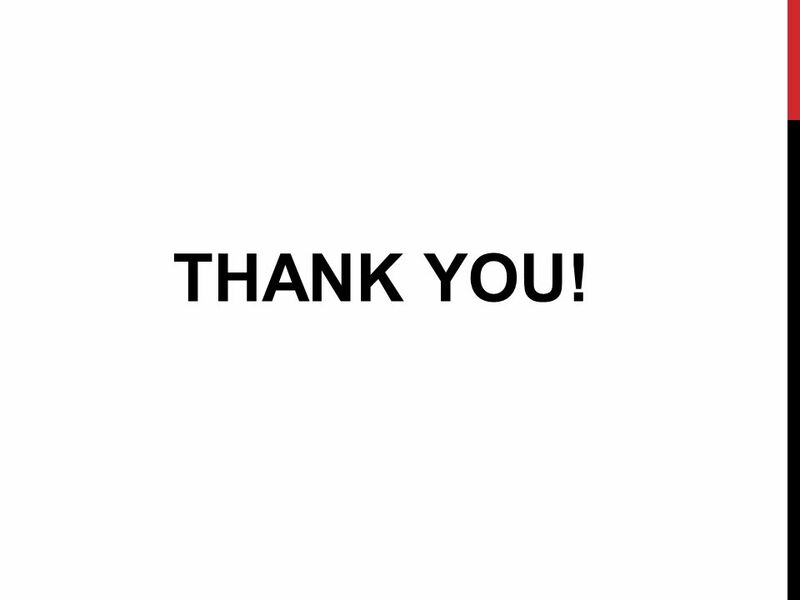 THANK YOU for turning them in on time!!!! The proposals are being reviewed by myself and ASSP President Diana Shen. 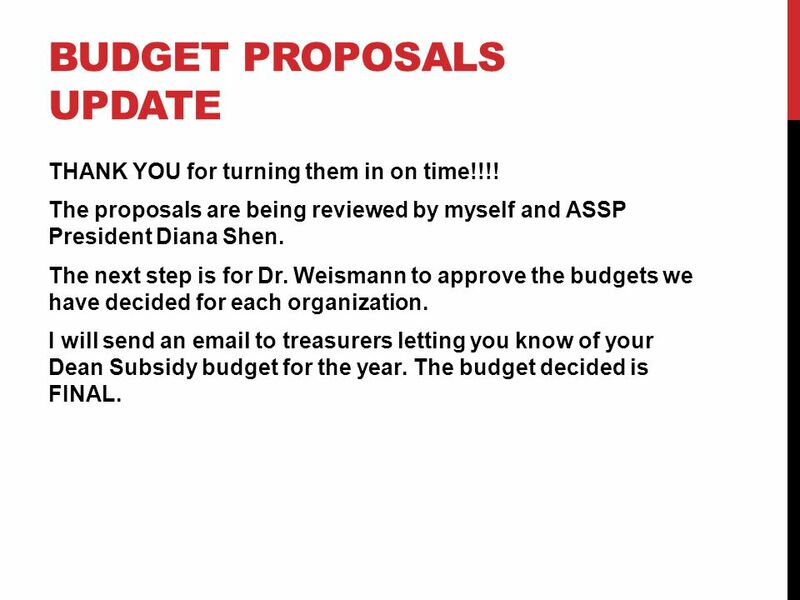 The next step is for Dr. Weismann to approve the budgets we have decided for each organization. 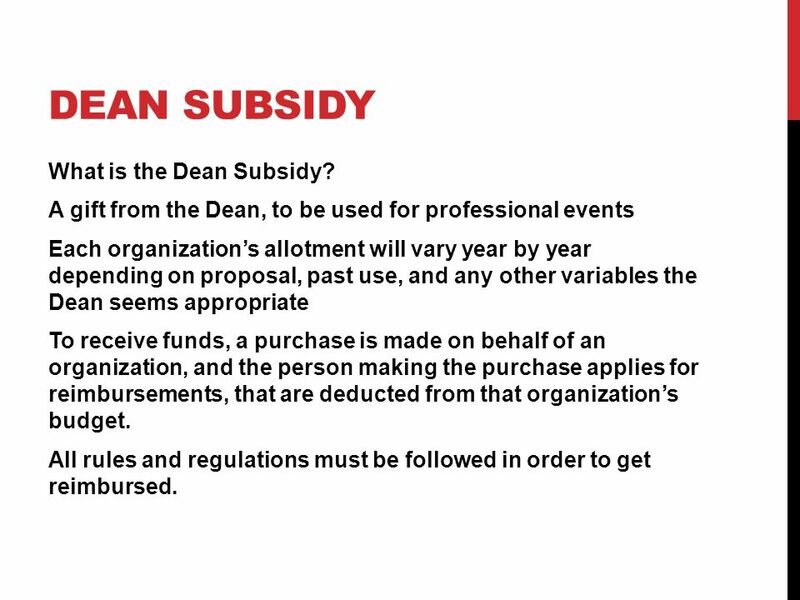 I will send an to treasurers letting you know of your Dean Subsidy budget for the year. The budget decided is FINAL. 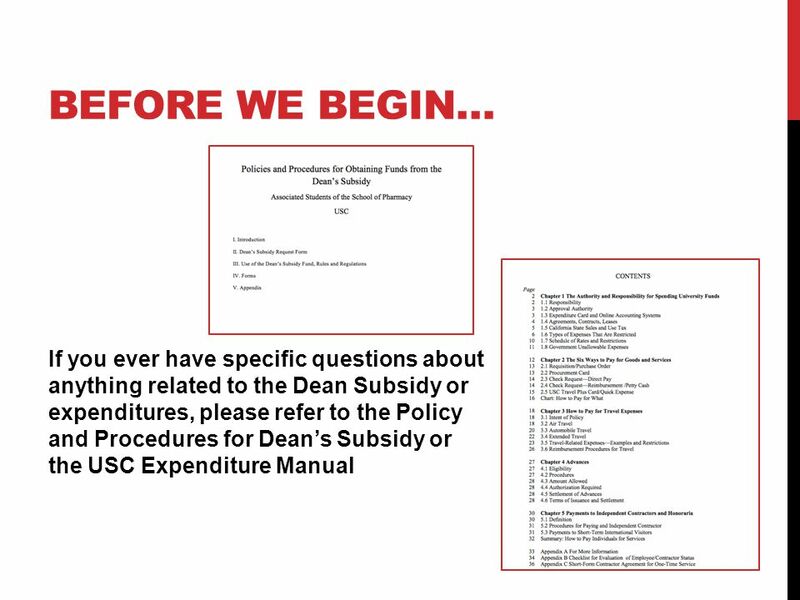 6 Dean Subsidy What is the Dean Subsidy? A gift from the Dean, to be used for professional events Each organization’s allotment will vary year by year depending on proposal, past use, and any other variables the Dean seems appropriate To receive funds, a purchase is made on behalf of an organization, and the person making the purchase applies for reimbursements, that are deducted from that organization’s budget. All rules and regulations must be followed in order to get reimbursed. 8 What is Allowed? 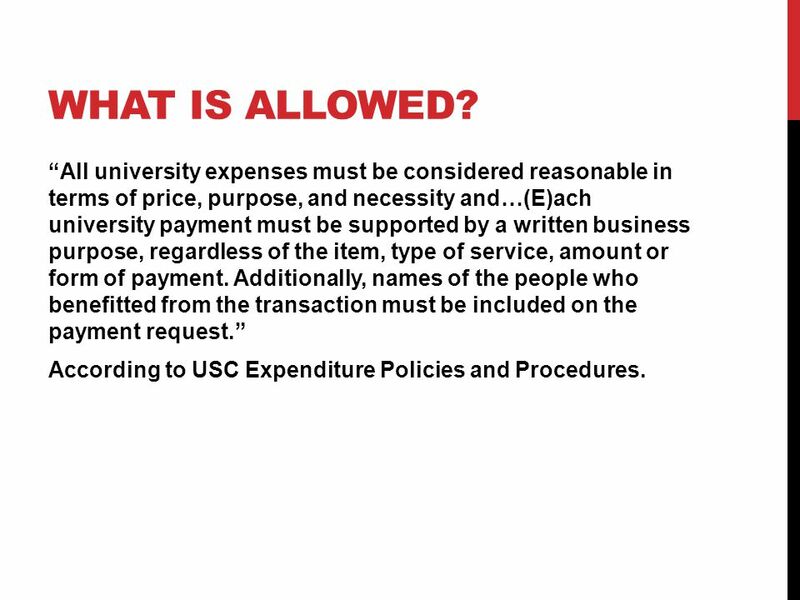 “All university expenses must be considered reasonable in terms of price, purpose, and necessity and…(E)ach university payment must be supported by a written business purpose, regardless of the item, type of service, amount or form of payment. 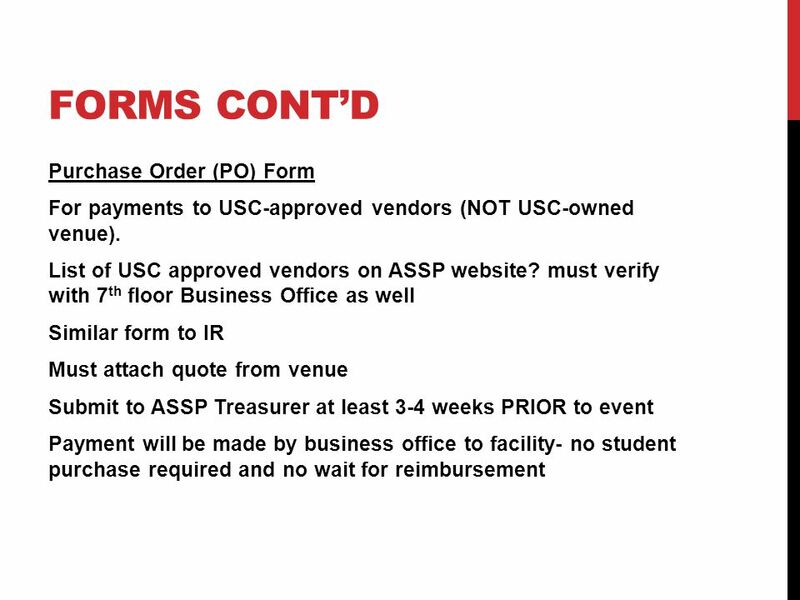 Additionally, names of the people who benefitted from the transaction must be included on the payment request.” According to USC Expenditure Policies and Procedures. 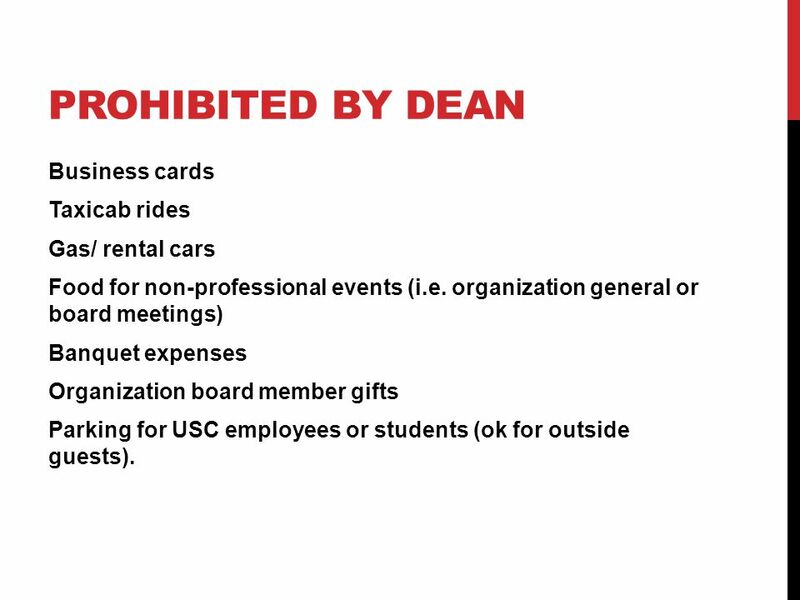 10 Prohibited by Dean Business cards Taxicab rides Gas/ rental cars Food for non-professional events (i.e. 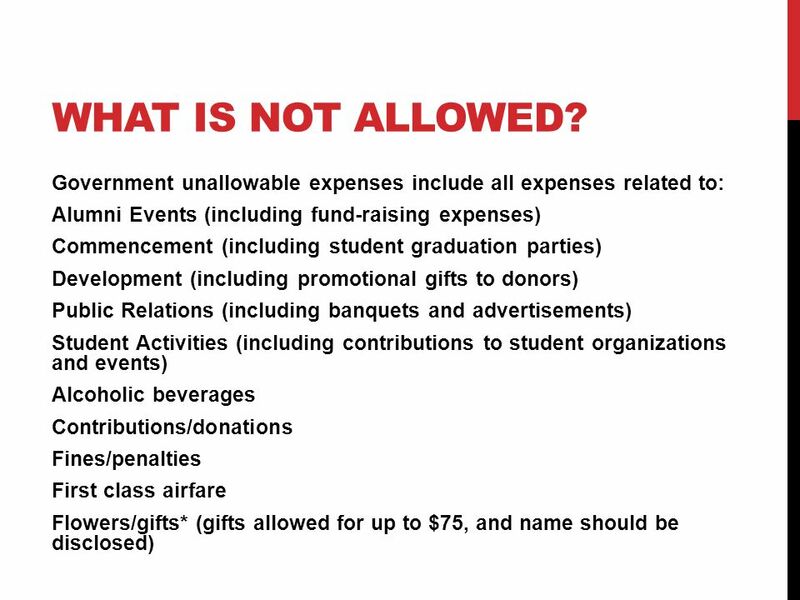 organization general or board meetings) Banquet expenses Organization board member gifts Parking for USC employees or students (ok for outside guests). 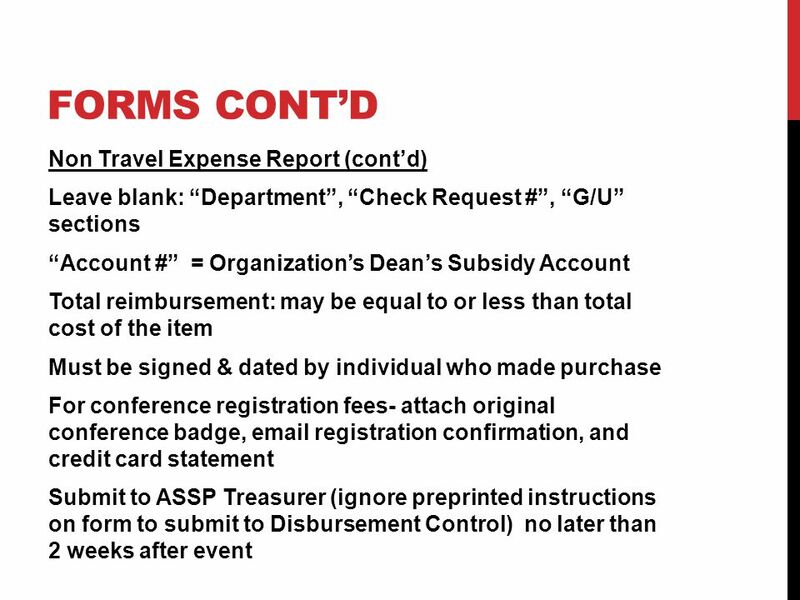 11 Reimbursement The student requesting reimbursement will complete the appropriate form and turn into the organization treasurer. 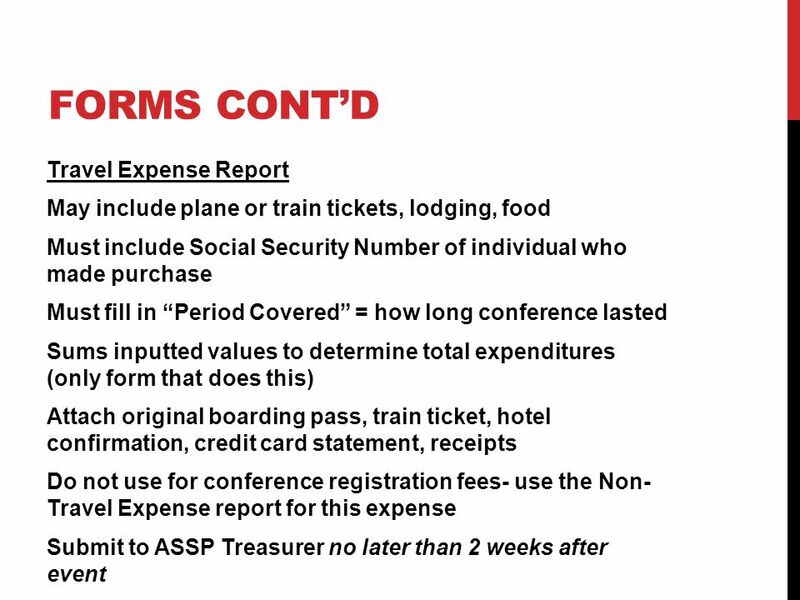 The organization treasurer will verify the form is complete and submit it to the ASSP Treasurer. 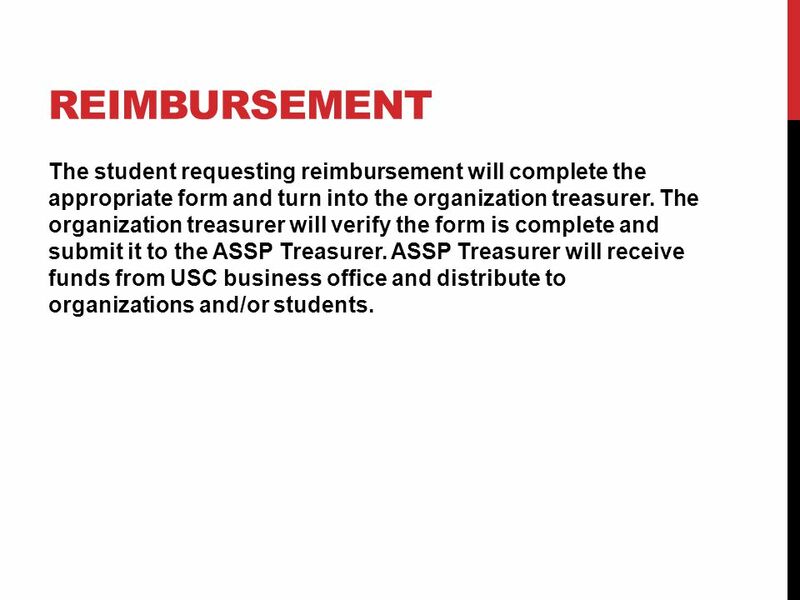 ASSP Treasurer will receive funds from USC business office and distribute to organizations and/or students. The most commonly used form! 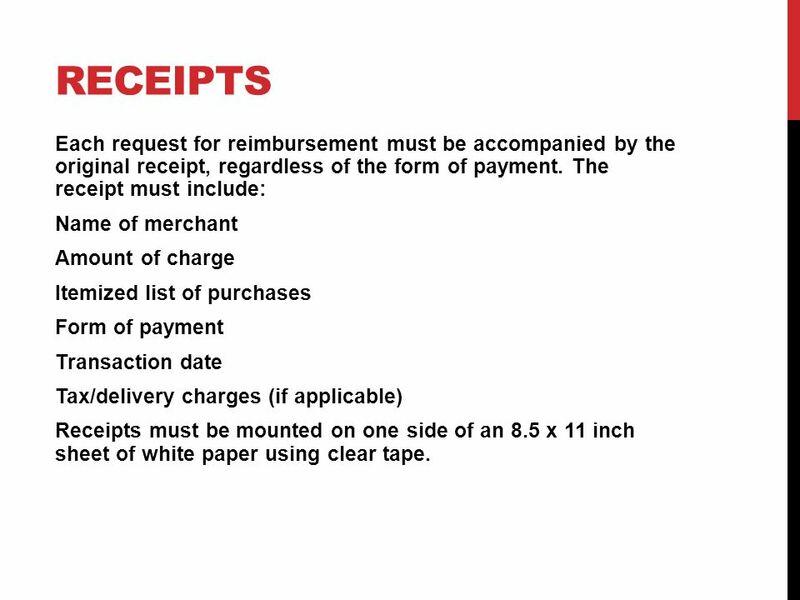 18 Receipts Each request for reimbursement must be accompanied by the original receipt, regardless of the form of payment. 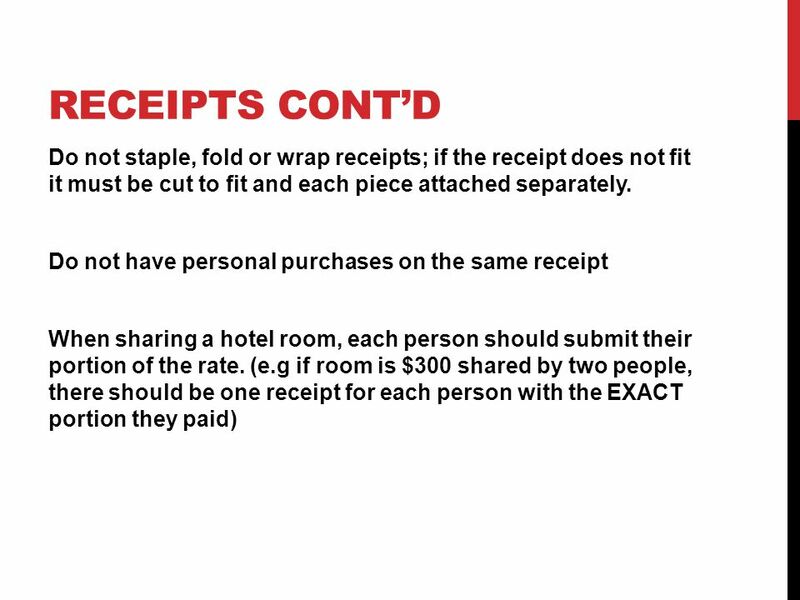 The receipt must include: Name of merchant Amount of charge Itemized list of purchases Form of payment Transaction date Tax/delivery charges (if applicable) Receipts must be mounted on one side of an 8.5 x 11 inch sheet of white paper using clear tape. 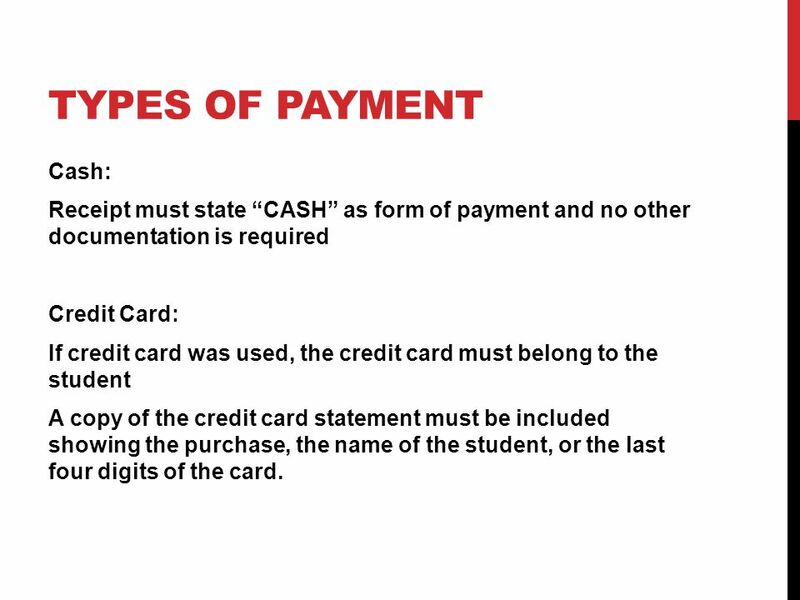 20 Types of Payment Cash: Receipt must state “CASH” as form of payment and no other documentation is required Credit Card: If credit card was used, the credit card must belong to the student A copy of the credit card statement must be included showing the purchase, the name of the student, or the last four digits of the card. 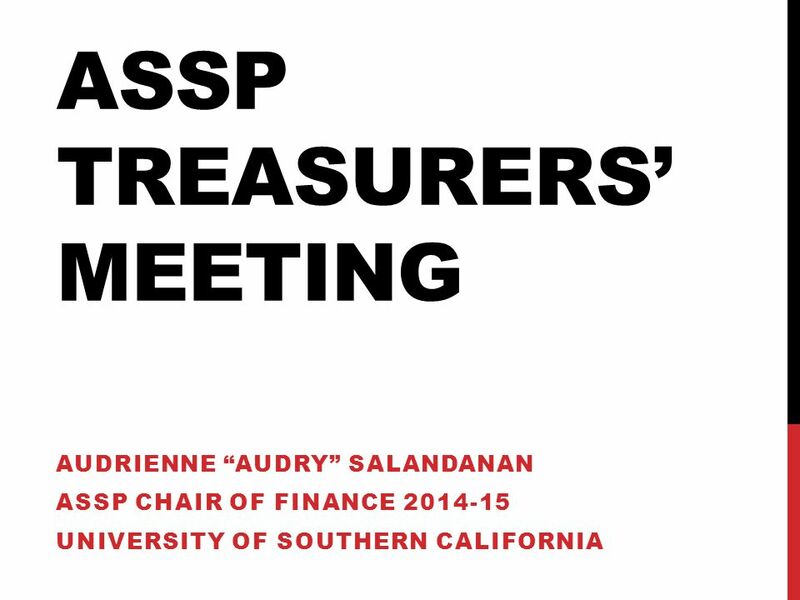 Download ppt "ASSP Treasurers’ Meeting"
Presented by The Office of International Programs. Sales Project Reports (Student Activity Reports) Activity Purpose Statement and Budget Sales Project Report for Distribution Purchase Request Form CPS. Purchasing Overview This card is only for orders under $5000. $5000 and above will be processed by Materiel Management. All procurement regulations. CITIBANK PROCUREMENT CARDS FISCAL YEAR Procurement Card Training. Welcome to President & Treasurer’s Training September 7, 2014. WELCOME  This presentation is intended for Registered Student Organizations (RSOs) with members who plan to travel and expect to be reimbursed. End Of Year Elluminate Session. All Standard PO’s must be RECEIVED ONLINE AND SENT TO A/P. A shipping line needs to be included on the original requisition. WAKULLA COUNTY Travel & Expense Procedures Manual Workshop September 2, 2008. 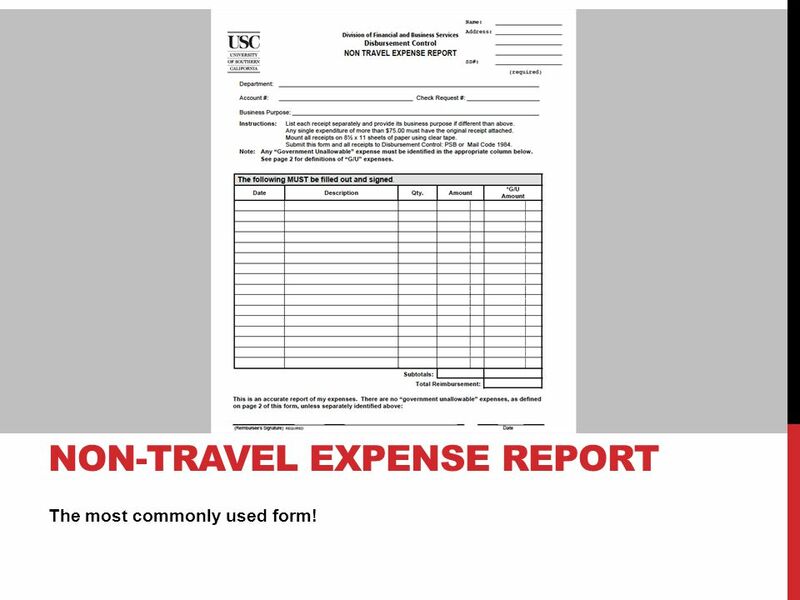 Accounts Payable Travel & Daily Mileage July 22, 2014. 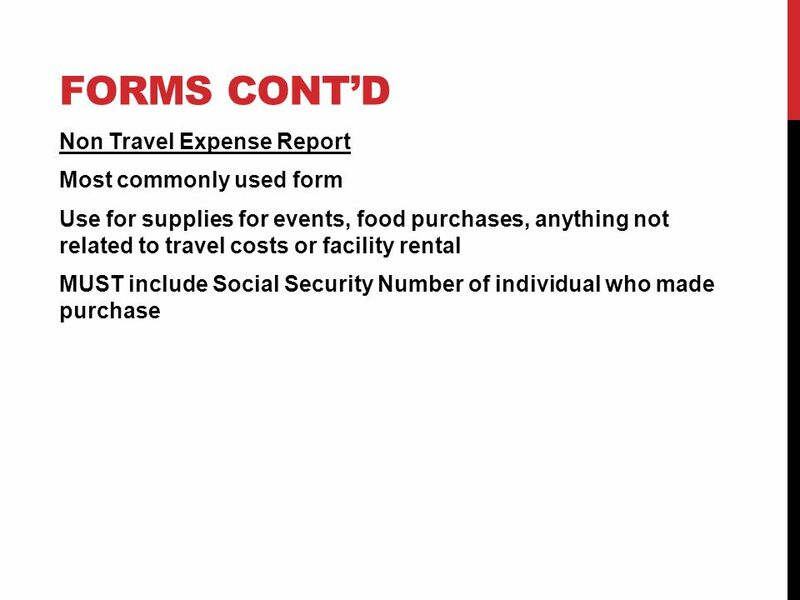 Local Mileage Reimbursement LogTravel Authorization Less than 50 miles, no overnight staying Nothing has changed on this form, just make sure that you. APSA Finance Guidelines. Purchasing Methods MethodForm Submission Deadline 1. 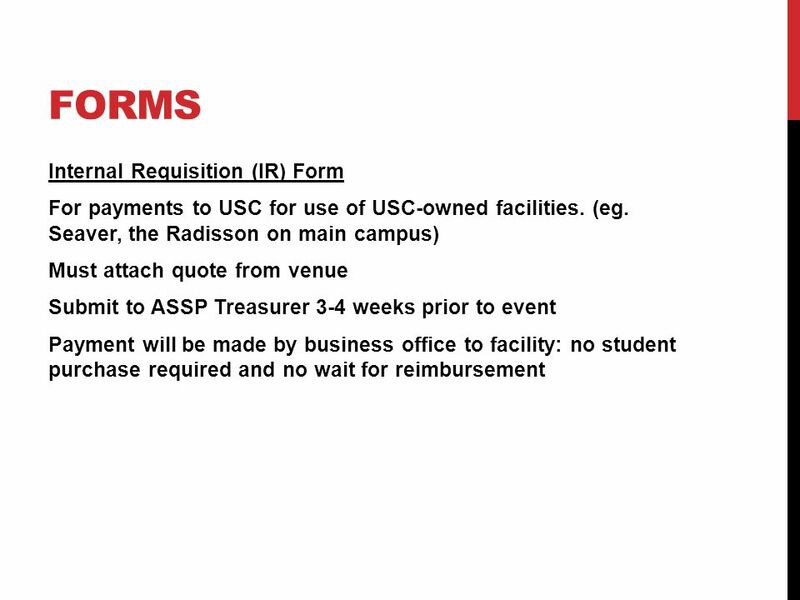 Reimbursement (You pay then get reimbursed at the end of the semester) 2. NCAR DOMESTIC TRAVEL PROCEDURES By Chris McDill March 3, 2008. Audits (2014/15) and Allocations (2015/16). Who and why? Any SLAC approved group who has received and is looking for funding for the year from. Budgeting, Reimbursements, & More!. Club Development Account Sport Club Checking Account (BB&T) Campus Recreation Allocation. FGCU Sport Clubs Financial Training Fall 2015. 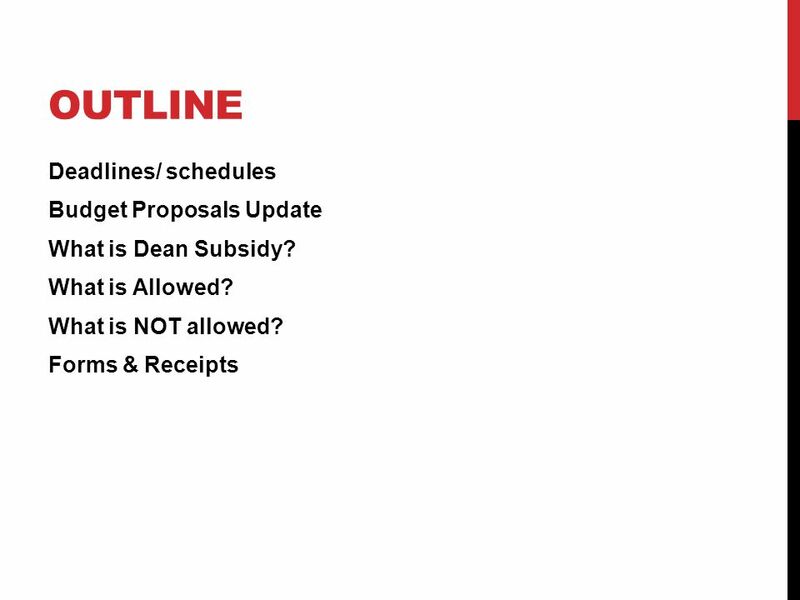 Today’s Agenda O Duties of a Treasurer O Types of Accounts & Access to Funds O Purchasing & Reimbursements.